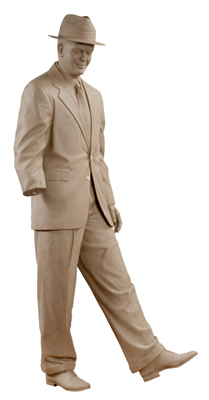 The lifesize sculpture of "Charles Fraser" is currently in production. The sculpture of Fraser, the founder of Sea Pines Plantation on Hilton Head Island, SC, will be based on a popular photograph published by the Saturday Evening Post in an expose of "People on the Way Up." Fraser will be depicted dressed in a suit, tie, and straw hat. He will be carrying a walking stick and will be walking alongside an alligator, which will be completed by another sculptor. The lifesize sculpture will be installed upon its completion on the lawn of Compass Rose Park.